South Carolina State head football coach Buddy Pough gives instruction to freshman long snapper Josh Pringle (51) and others before a play during the Nov. 24 home game against North Carolina Central on Willie E. Jeffries Field. South Carolina State head football coach Oliver "Buddy" Pough will be back coaching the Bulldogs for his 18th season at the helm in 2019, according to multiple sources with knowledge of the situation. Pough will hold his final Bulldog Weekly Press Conference for the 2018 season at 1 p.m. Wednesday, on the SCSU campus, when he is expected to discuss the season, recruiting for the future and his new contract with the program at his alma mater. "Based on the fact that there is no talk of a search for a replacement (for Pough), he must be coming back for at least another year," one source close to the football program told The Times and Democrat late Tuesday. In December of 2017, SCSU athletic director Stacy Danley announced a one-year extension for Pough to coach the Bulldogs through the 2018 season. Throughout this season, Pough answered questions about his future by saying the plan was still in place to review things with Danley after the season and go from there. "We've been a top-notch program over a long period of time," Pough said a year ago at his 2017 postseason press conference. "We've had great seasons and we've developed guys and given them the opportunity to become some of the better players around. "I still enjoy getting up and going to work, and I still enjoy coaching. Whether or not that's something I'll have the chance to do for a long time from this point on is still to be determined." The 2018 Bulldogs team started off 0-4, but rebounded for a 5-6 record, including a 4-game win streak and a 4-3 record in Mid-Eastern Athletic Conference play. One more win in conference play would have clinched second-place in the conference standings for S.C. State, which ultimately finished in fourth place. The 2018 team put more young, inexperienced talent on the field than usual, with at least 21 first or second-year players among the 56 spots on the 2-deep depth chart throughout the campaign. Pough, a former All-MEAC offensive lineman for the Bulldogs, has led the program to two outright MEAC titles (2008 and 2009), shares of four others (2004, 2010, 2013 and 2014), and four trips to the FCS playoffs (2008, 2009, 2010 and 2013). In his 17 seasons leading the Bulldogs, the program has posted a 125-70 record, for a win percentage of 64.1. That includes a record of 99-37 against Mid-Eastern Athletic Conference competition. 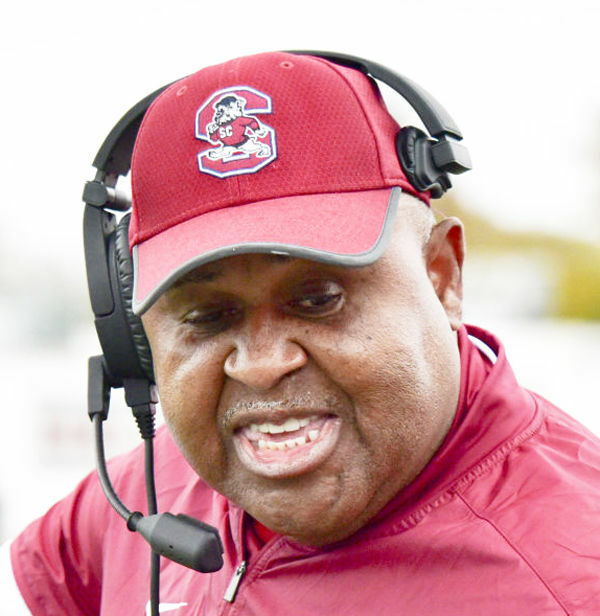 Pough needs just four more wins to become the all-time winningest coach in S.C. State program history, which would surpass his former head coach Willie Jeffries. Through the past 17 seasons, S.C. State has played 17 "guarantee" games to collect needed funding for the athletic program, taking on Football Bowl Subdivision teams including Clemson (4 times), Central Florida (3 times), Georgia Southern (2 times), Air Force, Georgia Tech, South Carolina, Central Michigan, Indiana, Arizona, Texas A&M and Lousiana Tech. If those 17 losses in "money" games are not on Pough's head coaching record, he holds a 125-53 record against fellow Football Championship Subdivision competition and NCAA Division II competition, for a stellar 70.22 win percentage.